Estimation of economic sustainability of a value model must not only be done for the sunny-day scenario that all your market assumptions will be satisfied and everyone is to be trusted, but also take into account the possibility that the market develops differently and some actors cannot be trusted. This means that you need to do a risk assessment. 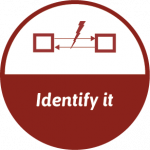 Consider the simple value model where a customer buys a product from a shop, and the shop buys a transport service to transport the product to the customer’s premises. What happens if the market changes? 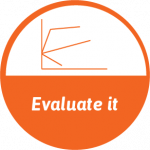 To answer this question you do a sensitivity analysis. Our tools can do this for you repeating net value flow analysis for different values of market parameters and plotting the result for you. For example, the next graph shows how the revenue of shops and logistics providers, and the expense of customers, varies with number of customer needs in the contract period. In general, revenue may depend in complicated ways on expenses and production costs, and sensitivity analysis provides insight in the dependence of revenues on the size of market segments and the number of occurrences of customer needs. This tells you which market assumptions impacts your revenue the most. In addition to market risk, there are risks of fraud by actors who cannot be trusted. We define fraud as a scenario where an actor does perform its part of a transaction, performs secret transactions, or colludes with other actors in a way that is unfair for some actors in the value network, and is therefore kept secret for them. Our software can generate these scenarios for you, and can also help you evaluate them, as illustrated next. The following screenshot shows the result of a fraud assessment by our tools. At the top left we indicated that the shop is to be trusted, and so by implication, customers and the logistics provider may commit fraud. The panel at the top in the middle shows the two possible frauds generated by the tool, ranked by loss to the victims. The highest ranked fraud has been selected, and the corresponding business model is shown in the bottom left panel. In this fraud model, the customer receives a product and a transport service, but does not pay for it. The panel at the bottom right shows how much each actor loses or gains by this, compared to the result they expected from the ideal case where no fraud occurs. The top right panel gives options for ranking all fraud scenarios. Ranking the frauds on loss for the victims puts the most severe frauds on top of the list, and ranking them on profitability for the fraudster puts the ones most attractive to the fraudster on top of the list. 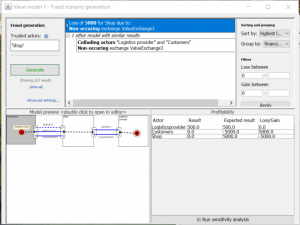 For other value models, the tool may generate thousands of different fraud scenarios, in which some actors collude, engage in secret transactions, or do not pay for services received. Value networks may be surprisingly complex, which creates unexpected possibilities of fraud that need to be analyzed before the value model of the network is implemented. To gauge the severity of a fraud scenario, it is possible to do a sensitivity analysis. Pushing the button at the bottom right gives us the following dependence on number of customer need occurrences. 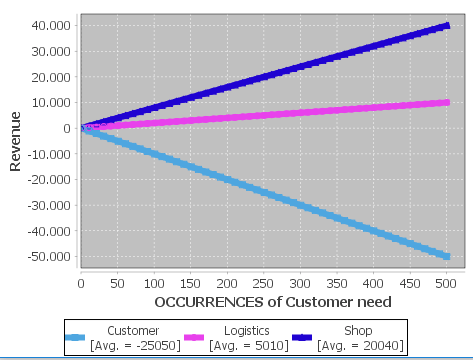 The graphs show that the loss of the shop depends linearly on the number of need occurrences, and that customers get a free ride by paying nothing. 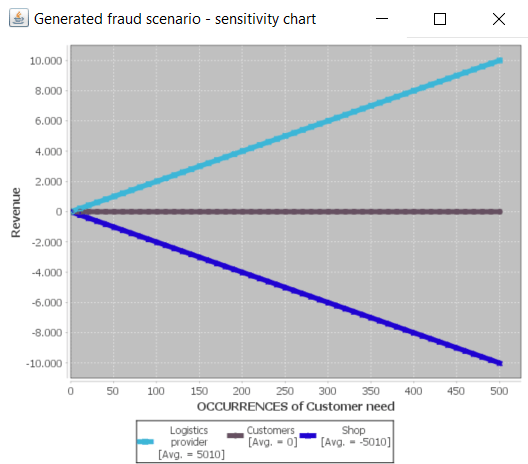 In general the sensitivity analysis reveals interesting information about the severity of a fraud scenario, and therefore about the need to mitigate them. The most important frauds must be mitigated by, for example, adding additional controls to the value model. Examples of controls that reduce fraud risks are the inclusion in the value model of trusted third parties, insurance, pre-contract screening. and execution monitoring. 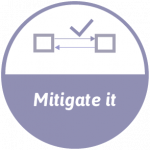 The risk of fraud may also be mitigated by including additional verification actions in the process model.